AjPHA Hopes and Dreams Barrel Racing and Pole Bending slot classes will be offered beginning with the 2012 AjPHA World Championship Show. All horses must be registered in the APHA Regular Registry. The slot application along with the first payment of $200 must be received in the APHA office by April 1, 2012. The slot nomination form along with final payment of $200 must be received in the APHA office by May 15, 2012. Horse and Exhibitor must be named by May 15, 2012. 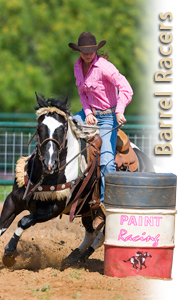 The following APHA Turn & Earn slot classes will be offered at the 2012 APHA World Championship Show: Regular Barrel Racing, Solid Paint-Bred Barrel Racing, Regular Pole Bending, and Solid Paint-Bred Pole Bending classes. The slot application along with the first payment of $200 must be received in the APHA office by March 15, 2012. The slot nomination form along with final payment must be received in the APHA office by September 10, 2012. Horse and Exhibitor must be named by September 10, 2012.